embroiderers, jewellers, medical, clinics, those with weak vision or diminished eye sight. Delivered Australia wide. lens and sit on a 5 legged heavy duty Stand. using Fluorescent Lighting and sits on a 5 legged pedestal. with larger Glass Lens and 5 legged pedestal. CAPG006B - Black Magi Lamps uses a Fluorescent 22 watt Light and flexible goose neck arm. CAPG008B - Black Magnifiers with Lamps using Fluorescent Light . Table Top Bracket included. CAPG008W - White Magnifiers with Fluorescent Light. Used mainly by the Beauty Salon industry. CAPG010 - Lamps with Magnifiers. Magnifier consists of a 5 dioptre rectangle Magnifying Glass lens plus an additional small 12 dioptre attachment. CAPG012W - Mag Lamps with a large Glass rectangular Magnifier Lens and 2 side Bulbs. CAPG040 - LED Magnifying Lamps with larger Lens and LED Lights. The Lamps in these LED Magnifiers consist of 108 LED diode Lights. LED Light uses far less power. CAPG041 - Mag Lamp on Floor Stand and LED Lights. The Lamp with these LED Magnifiers has 108 LED diode Lights. LED Lights use far less power. These Magnifiers have a large rectangular Glass 5 dioptre Lens. can be interchanged to be attached to a Bench mount. Coloured white. CAPG070 - Table Magnifying Lamps with 5 dioptre Magnifier lens and heavy base. Adjustable height and angle of head. Only available in white. 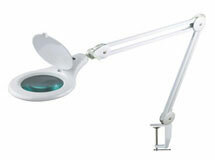 CAPG091 - Magnifying Lamp with LED Lights on Stand. The Lamp on these Magnifiers has 90 LED diode Lights. LED Light uses far less power. These Magnifiers sit on a 4 legged pedestal. Only available in white. CAPG001WL - Magnifier lens, made of Glass, round with a diameter of 2.5 cm and Magnification of 5 dioptre or 2.25 times. CAPG003WL - Rectangle Glass Magnifier lens, size - 17.75 x 15.5 cm, Magnification - 5 dioptre or 2.25 times. CAPG005L - 14 watt circular Light Bulb (Fits CAPG005 Lamps). CAPG030B - Black heavy duty Floor Stand with 5 legs. CAPG030W - White heavy duty 5 legged Floor Stand. CAPG031B - Floor Stand with 4 legs in black. CAPG031W - White Floor Stand with 4 legs. CAPG050B - Black metal Wall Brackets. CAPG050W - White metal Wall Brackets. CAPG051B - Heavy duty black Table Brackets for Bench Lamps. CAPG051W - Heavy duty white Table Brackets for Magnifying Desk Lamps. CAPG052B - Standard black mount for Desk Lamps. CAPG052W - Standard white mounts or Desk Clamps. CAPG053 - 2 pin 9 watt replacement Light Bulb (Replacement Lamps). CAPG053A - 4 pin 9 watt replacement Bulb (Replacement Lamps). CAPG054 - 22 watt circular Bulb (Replacement Lamps). ` CAPG056 - 28 watt rectangular replacement Bulb (Suits CAPG010 Lamps). CAPG057B - Black circular metal screw in type mount. CAPG057W - White circular metal screw in type mount. We can organise for delivery Australia wide. Online payments processed using the PayPal gateway. Further information can be obtained on (02) 6162 1950 or via email. * Variety of Portable, Table Top, Desk Top, Bench Magnifiers and Floor models available. * Items are available to be examined at our Canberra store.